...... To help avoid typos, you must enter your password twice. If you do type a different password, Encrypt my Folder will prompt you for a correction. The password you enter is used for each folder and file to be locked. What's special about Encrypt My Folder? * Password protection for files, folders. * Encrypt My Folder support of NTFS and FAT systems. * You need not run Encrypt my Folder at all time, it supports lock all items when exit. 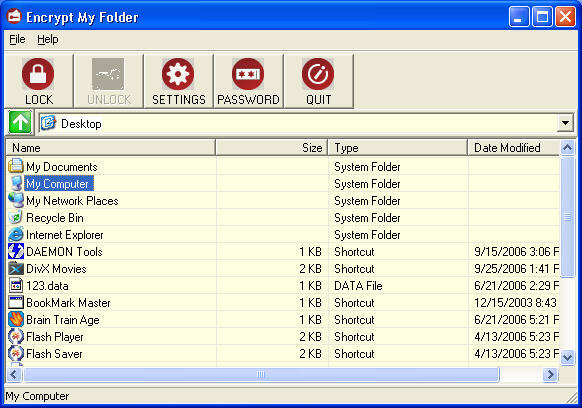 Protect your files, folder with your password in an easy way. Hide folders and encrypt files with on-the-fly AES encryption. Hide folders and encrypt files with a secure on-the-fly AES encryption. Encrypt and Decrypt PDF files. Set Permissions. Set Info Tags. Password PDFs. Qweas is providing links to Encrypt My Folder 1.2 2012 as a courtesy, and makes no representations regarding Encrypt My Folder or any other applications or any information related thereto. Any questions, complaints or claims regarding this application Encrypt My Folder 1.2 2012 must be directed to the appropriate software vendor. You may click the publisher link of Encrypt My Folder on the top of this page to get more details about the vendor.